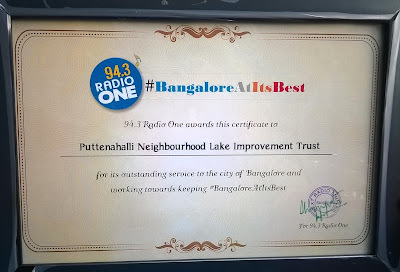 PNLIT is delighted to be one of the recipients of 94.3 Radio One's #BangaloreAtItsBest awards, given away at a function in Bangalore today. 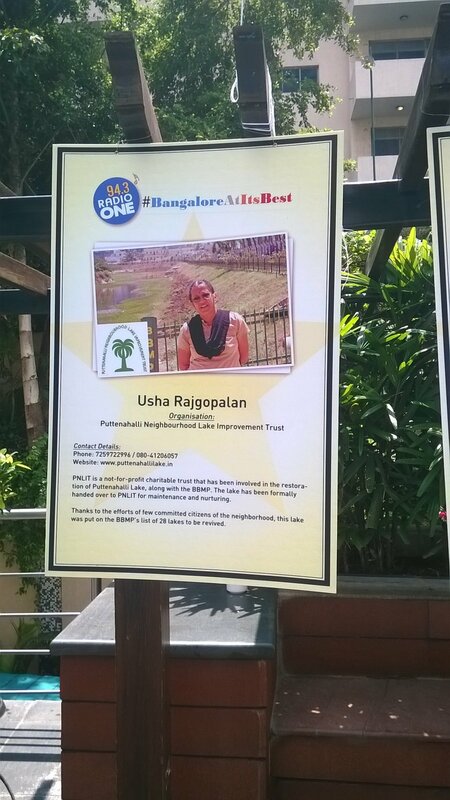 There were about 27 individuals/groups/businesses that were recognised for "outstanding service to the city of Bangalore and working towards keeping #BangaloreAtItsBest". I was happy to collect the certificate from the Chief Guest Justice Santosh Hegde, on behalf of PNLIT. 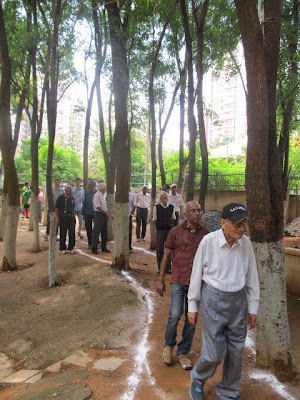 Some 40 people - South City assn (SUGRUHA) Management Committee, members and staff, PNLIT trustees, BBMP and KSPCB officials, residents from the neighbourhood were waiting eagerly. It was a very special day not just for them but indeed also for the city of Bangalore. 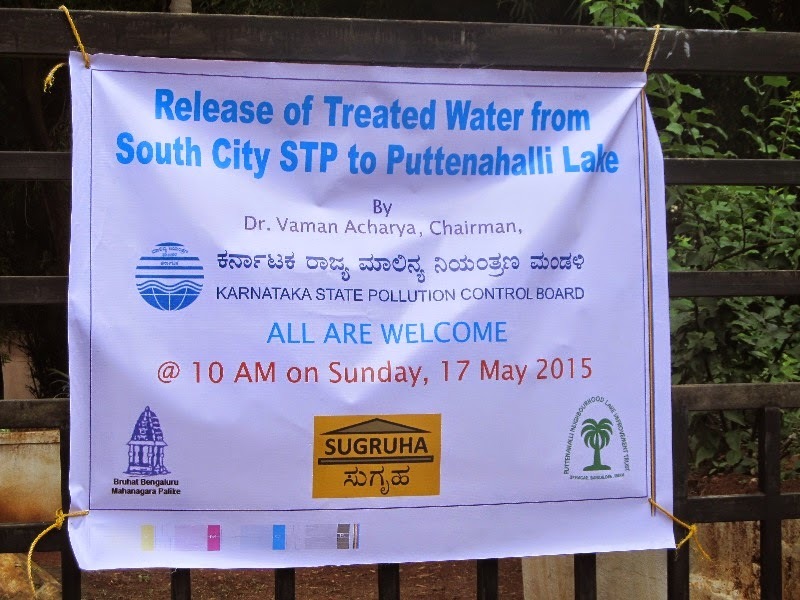 A milestone was set that morning when at 10:30 a.m., Dr Vaman Acharya, Chairman of the Karnataka State Pollution Control Board (KSPCB) released excess treated water from the STP at South City to the Puttenahalli Lake. For the first time in the city, treated sewage from the STP of an apartment complex was let into a lake. 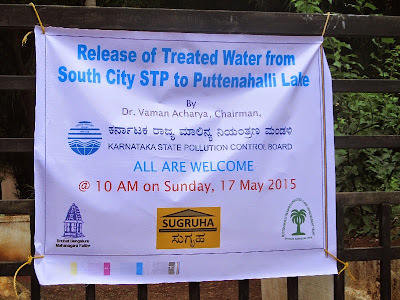 KSPCB gave the go ahead for this unique project, run as a pilot, for several reasons - the fact that the STP at South City is maintained well; that the treated water meets urban reuse parameters set by the board, and that PNLIT have shown their commitment to the welfare of the lake. 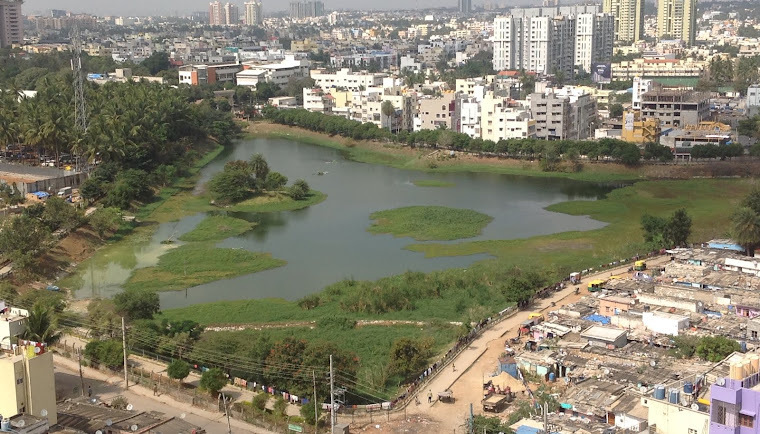 Thus PNLIT, the first citizens' group in the city to become official custodians of a lake and a model for other lakes has initiated another new trend of filling a lake. 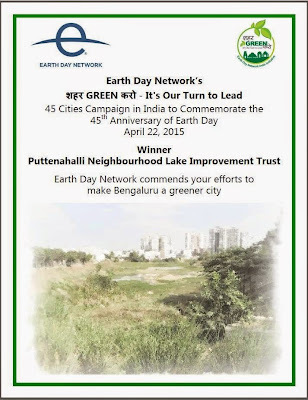 BBMP, the "owner" of Puttenahalli Lake is the third partner in this arrangement. South City STP was designed to treat about 8 lakh ltrs of sewage water every day. Of this, 4 lakh litres/day was used within the community, for toilet flushing and for the garden. The rest was being pumped into the Arekere Under Ground Drainage (UGD). Not only did this mean running costs for the pump but good treated water had to be let into the UGD along with raw sewage. At the same time, monsoon dependent Puttenahalli Lake would dry up every summer leading to loss of fish and depriving birds of their habitat. Discharging the excess treated water into the lake meant that both problems could be solved in one stroke. Henceforth the lake will get water throughout the year while South City community saves on the pumping cost and can feel justifiably proud of doing their bit for Nature. To ensure water quality, KSPCB has agreed to install a sensor which will send an online monitoring report. On successful completion of the trial, it can be replicated with other apartment complexes and their neighbouring lakes. In his speech, Dr Acharya was all praise for the three different parties that made such a feat possible - BBMP, South City and PNLIT. Only with such participation and public vigilance, he said, is it possible to protect lakes. Mr Raffi, resident owner, South City, briefed the gathering about how the capacity of the STP was increased from 8 lakh litres/day to nearly 11 lakh litres/day. This was made possible by modifying the plant as suggested by KSPCB. It led to substantial saving in modification cost as well. With the crowd clapping and cheering, Dr Acharya opened the valve and let the treated water flow from the chamber along the pipe. Everyone set off to see the water fall into the lake. It fell into the deep silt trap in a clear stream and began to overflow into the wetland. More cheers followed and guesses about how long it would take for the lake to fill to the brim. With an average inflow of 6 lakh litres/day, discounting evaporation from surface, it would take about 10 months to a year for the 10 acre Puttenahalli Lake to brim over. The crowd dispersed with big happy smiles but for South City residents, it was a morning tinged with deep sorrow about the untimely demise of their Property Manager Mr Manjunath on 8th May. He had worked tirelessly for the past several months to ensure that the modification to the plant was carried out on time and everything set in order to facilitate the release of the treated water into the lake. It all went as per plan except that he was not present to see this event take place. RIP, Mr Manjunath. We are delighted by the performance of our three students in the II P.U.C. exams. All of them got over 70% with Deepubai getting 75%, Sadiqa 71% and Ramya 72%. Living in the hutments on the lake bund, they joined our Classes at the Lake program (Teach program) three years ago. Thanks to V.P. Karthik, now pursuing PhD at IIT, Chennai, Anisha Kaul and Swathi Jayakumar, the girls' performances were beyond their own expectations in Std 10 as well. Our teachers not only coached them but also encouraged them to dream big. Deepu wants to do engineering and is awaiting the CET results. Sadiqa wants to become a medical doctor while Ramya is looking to become a Chartered Accountant like her teacher, Lalitha Kamath. Kudos to these girls and more so to their teachers who took time out from their busy schedules to help out these children. 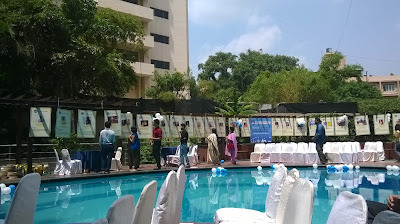 We salute each of them - Lalitha Kamath, Ramakrishna Rao, Hema Nair from South City, Sudha Veeramani, Vijetha Sanjay, Dr. C.S.N Iyer, Seema Doraiswamy from Brigade Millennium, Vivek Krishna from RBI Layout and Ancy Tom all the way from BTM Layout. Ancy is particularly delighted with her student, Deepu, for scoring 98% in Computer Science. A big thanks to all the teachers. 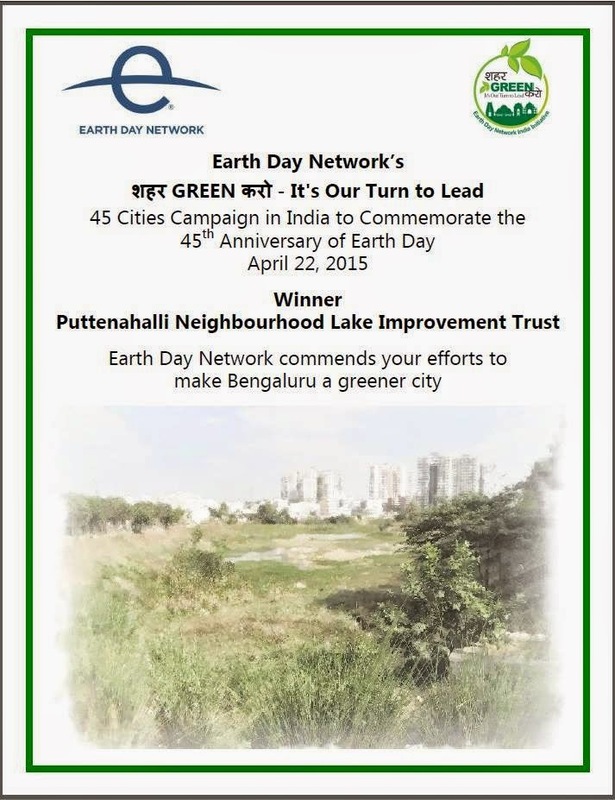 PNLIT is happy to inform you that we are one of the winners of Earth Day Network-India's शहर GREEN करो - It’s Our Turn to Lead Contest. The result was announced today. 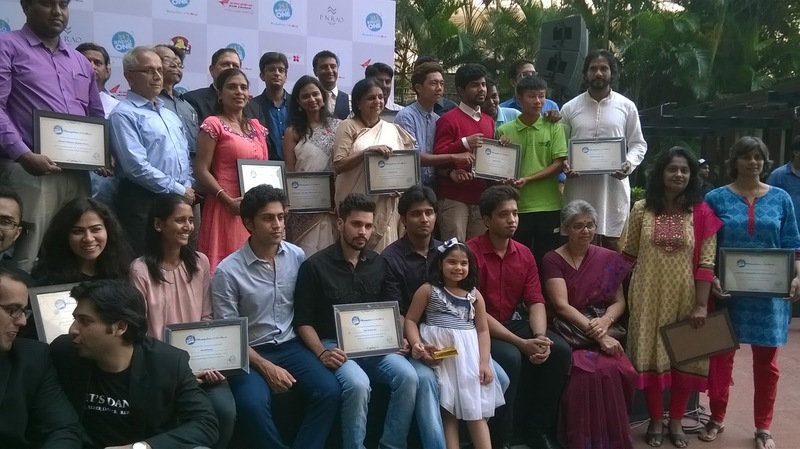 The other winners are from Kozhikode, Mumbai, Srinagar, Raipur and Varanasi and can be seen on the Earth Day Network website here. 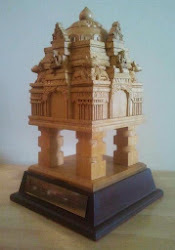 Details about PNLIT's entry can be seen on the Green Cities India Facebook page here. To commemorate the 45th anniversary of Earth Day (celebrated on 22nd April) this year, Earth Day Network-India, in February, had called for entries from 45 cities on how to make their cities "Swachh" and "Green". 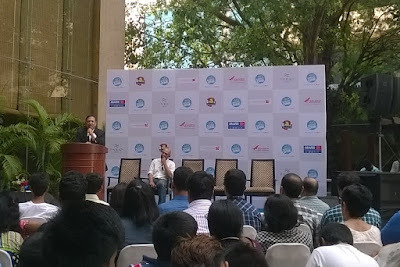 Each of the contestants had to register with a specific task and accomplish the goal within 45 days. 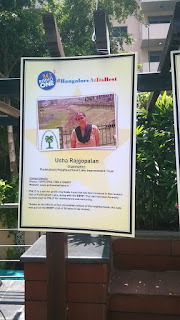 PNLIT's entry was on the pre-monsoon lake cleaning drive we had organized on 28th March. This particular cleaning drive had been sponsored by the Karnataka State Pollution Control Board (KSPCB) and the event was attended by the KSPCB Chairman, Dr. Vaman Acharya. Another dignitary who accepted our invitation to visit the lake that day was the Upa Lokayukta, Hon'ble Justice Sri Subhash B. Adi. It was truly special for us to welcome these guests as it was to see our volunteers picking up plastic and other trash scattered on the lake bed with vigour and enthusiasm. Heartfelt thanks to all our well-wishers, for the unstinting support to Puttenahalli Lake and to PNLIT!